Rarely people experience an illusion that the world is upside down. They see the ceiling as the floor, and the floor as the ceiling. Inversion illusions may occur both under certain normal circumstances as well as in medical disorders. In normal persons, inversion illusions may occur when gravity reference signals are gone. In the space-lab, astronauts no longer have gravity to orient themselves and may experience inversion. Divers may experience inversion illusions when somatosensory cues indicating the direction of downward (i.e. foot pressure), is absent. Once the author of this page had an experience where a volunteer subject undergoing an experiment had an inversion illusion. A protocol was being developed where the subject had their head 20 cm anterior to the axis of rotation of a rotatory chair, and it was being "stepped" up from stationary, to 400 deg/sec, in 100 deg/sec steps, with a wait of 2 minutes in between each step. This protocol involves a huge sensory conflict between the sensation of rotation, and the centrifugal force being exerted on the head. After going from 300->400 deg/sec, the subject suddenly felt as if he was upside down, yelled, and attempted to pull his head out from the head-holder. Not a good idea. But the point here is that entirely normal people can experience inversion illusions when they undergo vestibular conflicts. Inversion illusions in otherwise healthy persons are often due to migraine, as migraine is the most common cause of focal neurological symptoms in otherwise healthy persons (Arjona & Fernandez-Romero, 2002). Other reports in the literature include MS (Deniz, Keklikoglu, Vural, Temel, & Dilbaz, 2012; Okuyucu, Okuyucu, Karazincir, Akoglu, & Duman, 2008; Dogulu & Kansu, 1997), seizures (Unal, Cila, & Saygi, 2006) (Ringel, Brick, & Riggs, 1988), and other territory strokes (River, Ben Hur, & Steiner, 1998). Odd and unusual reports include inversion illusions due to third ventriculostomy (Pamir, Ozer, Siva, Ozek, & Kansu, 1990), and frontal lobe abcess (Solms, Kaplan-Solms, Saling, & Miller, 1988). Although there is no literature about Meniere’s and inversion illusions, I have encountered patients with this occasionally in my practice. Putting these all together, almost all causes of inversion illusions include brainstem lesions, and most are around the territory of the vestibular nucleus. The location of the otolithic apparatus in the ear is shown in the illustrations above. Thinking physiologically, one might conjecture that inversion illusions should be a result of saccule disturbances. Also, unilateral disturbances of otolith function should, in theory at least, only cause tilts of the world. However, one might conjecture based on experiences of normal persons, that any disorder that increase the uncertainty of processes that estimate orientation to vertical, might also be associated at least occasionally with inversion illusions. 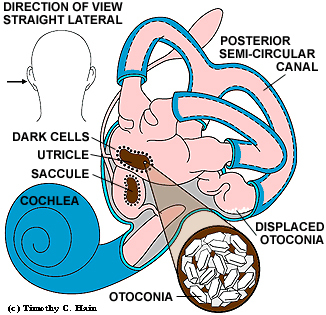 Otoliths pathways extend in the brainstem from the 8th nerve entry zone in the medulla, upwards to the cerebellum, the oculomotor nuclei, and end in temporal cortex close to auditory cortex. Discrete lesions of the brainstem, such as from tumor or MS placques, to the authors knowledge, are not reported as sources of inversion illusions. However in Wallenberg's syndrome, a stroke syndrome also called lateral medullary syndrome, otolith connections are disturbed and inversion illusions have been reported (Hornsteen 1974). Human brainstem. 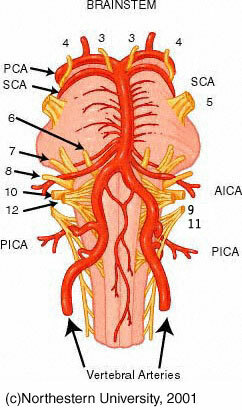 Inversion illusions have been reported due to strokes related to disease of the vertebral arteries, the posterior inferior cerebellar arteries (PICA), and from the basilar artery (large vessel going down middle of brainstem). At the highest level, perhaps an example of a disturbance of vision, a syndrome called "top of the basilar syndrome", can be accompanied by an inversion illusion. 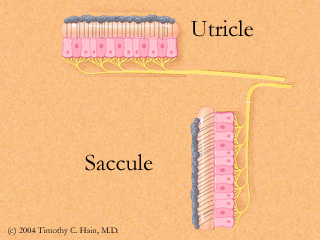 Because both brainstem pathways and visual cortex are affected by syndromes at the "top of the basilar", inversion syndromes from this cause might theoretically fall into two categories, one due to a otolith connection disturbance, and the other due to visual distortions. Given the diverse causes reported to cause inversion illusions, the most logical approach is to attempt to determine the cause. If no cause can be identified, we favor treating for complex migraine. Arjona, A., & Fernandez-Romero, E. (2002). [Room tilt illusion: Report of two cases and terminological review]. Neurologia, 17(6), 338-341. Charles, N., Froment, C., Rode, G., Vighetto, A., Turjman, F., Trillet, M., & Aimard, G. (1992). Vertigo and upside down vision due to an infarct in the territory of the medial branch of the posterior inferior cerebellar artery caused by dissection of a vertebral artery. J Neurol Neurosurg Psychiatry, 55(3), 188-189. Deniz, O., Keklikoglu, H. D., Vural, G., Temel, S., & Dilbaz, F. A. (2012). Acute "upside-down" visual inversion in a patient with multiple sclerosis. Neurol Sci, 33(3), 635-637. doi:10.1007/s10072-011-0781-3 Dogulu, C. F., & Kansu, T. (1997). Upside-down reversal of vision in multiple sclerosis. J Neurol, 244(7), 461. Hornsten G. Wallenberg's syndrome. I. General symptomatology with special reference to visual disturbances and imbalance. Acta Neurol Scand 1974:50:434-446. Pamir, M. N., Ozer, A. F., Siva, A., Ozek, M. M., & Kansu, T. (1990). "Upside down" reversal of vision after third ventriculostomy. J Clin Neuroophthalmol, 10(4), 271-272. Ringel, R. A., Brick, J. F., & Riggs, J. E. (1988). Upside-down epilepsy: a manifestation of second sensory seizures. South Med J, 81(11), 1466. River, Y., Ben Hur, T., & Steiner, I. (1998). Reversal of vision metamorphopsia: clinical and anatomical characteristics. Arch Neurol, 55(10), 1362-1368. Solms, M., Kaplan-Solms, K., Saling, M., & Miller, P. (1988). Inverted vision after frontal lobe disease. Cortex, 24(4), 499-509. Steiner, I., Shahin, R., & Melamed, E. (1987). Acute "upside down" reversal of vision in transient vertebrobasilar ischemia. Neurology, 37(10), 1685-1686.